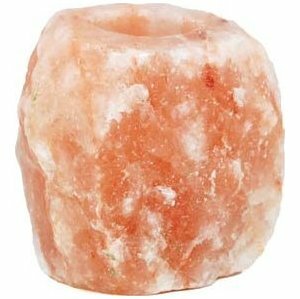 The warm pink glow of this natural salt candle holder is sure to enhance the atmosphere of any space while helping to purify the air within. Position candle holder near a favorite sitting spot such as on a side table or desk to increase one's exposure to the purified air circulating about the warm salt while the candle is emanating it's light. Each tealight holder is created from a hollowed out hunk of natural pink salt, therefore the size and exact shape of this natural holder as well as the color of the salt varies. This tealight candle holder is approximately 3 and 1/2 inches in diameter and weighing about 3 pounds.